People loved crossing the Pond hanging from the belly of the Hindenberg until 1937 when that craft met its toasty demise in Lakehurst, NJ. And of course, what discussion of blimps/airships would not be complete without a mention of Goodyear's large stable of blimps? They've been present in our skies over major sporting events as long as anyone reading this have been alive. 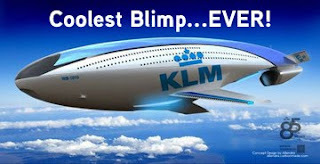 We fixed wing drivers like to poke fun at the blimp crowd once in a while, for reasons that are unclear. Maybe it's their shape, or their ill handling ways, or their less than stellar performance numbers. But on occasion a story pops into our world that again makes me wonder publicly if blimps - all right, airships – might not be a pretty decent way to carry humans to Grandma's house. "This whale-like entry into KLM Indonesia's aircraft design competition reminds me of the French "Manned Cloud" concept from a few years back. The WB-1010 would seat more than 1,500 people, and use a combination of super-jet, helium, and wind power. The concept's designer, Reindy Allendra, imagines the aircraft being constructed from material similar to the giant Airbus A380's GLARE composite: Glass-Reinforced Fiber Metal Laminate made of thin layers of metal and glass fiber. The WB-1010 would supplement its fuel use with the ability to harvest wind energy into electricity. An extractable robotic stand would also be used during the craft's vertical landings." "On Monday the 27th October 2004, the [late] U.S. American adventurer Steve Fossett and his Co-Pilot Hans-Paul Stroehle set a new speed world record for airships. They were flying the 1000 meter course in both directions with an average speed of 111.8 km/hour [69.4 mph]." So even by flying at world record speeds, it will take an airship about 40 hours in a no-wind situation to fly the LAX-JFK route. Respectable, sure it beats the crap out of Amtrak, but in today's short attention span world, will anyone find that many paying pax willing to camp out in a blimp for almost two full days to get across the country? "Strato Cruiser Airship, Floating Along Without Wings or Reality - The rich are different from you and me, so maybe they'll have time to ride in this Strato Cruiser Airship, sitting back and getting pedicures while this helium-lifted carbon fiber blimp lumbers along. The design concept calls for spectacular restaurants inside staffed by star chefs, a spa, private suites, office space, a swimming pool and even a resident DJ. If this all gets too boring for you, the designers also plan to install a bungee-jumping platform." Now who among us wouldn't want to try out a little bungee jumping on the way to a business conference? As we have discussed here before, how to work commercial airship fleets into our jammed airspace might be interesting. But nobody I know of is planning to launch scheduled airship service before the "next generation" of ATC comes online. By then, we hope there will be systems in place to allow high speed passenger jets and much slower piston singles to weave their way around some tricked out airships as they plod along. And as a person who flat digs trains and thinks a great deal about someday taking a slow, scenic train ride across this great land of ours, maybe doing the same thing at 500 AGL in a blimp might be, oh, about a 1,000 times better.